Schoft, V. K., Chumak, N., Bindics, J., Slusarz, L., Twell, D., Köhler, C. and Tamaru, H. (2015). SYBR Green-activated sorting of Arabidopsis pollen nuclei based on different DNA/RNA content. Plant Reprod 28(1): 61-72. Ibarra, C. A., Feng, X., Schoft, V. K., Hsieh, T. F., Uzawa, R., Rodrigues, J. A., Zemach, A., Chumak, N., Machlicova, A., Nishimura, T., Rojas, D., Fischer, R. L., Tamaru, H. and Zilberman, D. (2012). 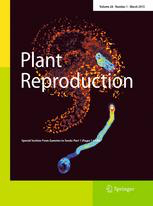 Active DNA demethylation in plant companion cells reinforces transposon methylation in gametes. Science 337(6100): 1360-1364. Lang-Mladek, C., Xie, L., Nigam, N., Chumak, N., Binkert, M., Neubert, S. and Hauser, M. T. (2012). UV-B signaling pathways and fluence rate dependent transcriptional regulation of ARIADNE12. Physiol Plant 145(4): 527-539. Schoft, V. K., Chumak, N., Choi, Y., Hannon, M., Garcia-Aguilar, M., Machlicova, A., Slusarz, L., Mosiolek, M., Park, J. S., Park, G. T., Fischer, R. L. and Tamaru, H. (2011). Function of the DEMETER DNA glycosylase in the Arabidopsis thaliana male gametophyte. Proc Natl Acad Sci U S A 108(19): 8042-8047. Schoft, V. K., Chumak, N., Mosiolek, M., Slusarz, L., Komnenovic, V., Brownfield, L., Twell, D., Kakutani, T. and Tamaru, H. (2009). Induction of RNA-directed DNA methylation upon decondensation of constitutive heterochromatin. EMBO Rep 10(9): 1015-1021. Eisenhaber, B., Chumak, N., Eisenhaber, F. and Hauser, M. T. (2007). The ring between ring fingers (RBR) protein family. Genome Biol 8(3): 209.